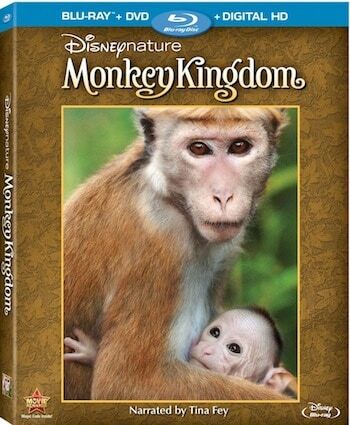 I am so excited to share with you that MONKEY KINGDOM, a spectacular tale set among ancient ruins in the storied jungles of South Asia from Disneynature, the studio that brought you Chimpanzee and Bears, will be released on DigitalHD, DMA, and Blu-ray Combo Pack on September 15! Maya, a clever and resourceful monkey, and her family will make you laugh and warm your heart as she realizes her dreams for her son’s future. Narrated by Tina Fey, own this breathtaking feature film on Digital HD, Disney Movies Anywhere (DMA) & Blu-ray Combo Pack on September 15. Enjoy this must-own film and Disneynature will donate a portion of first-week sales to Conservation International to help protect endangered species in their natural habitats.